Fearing that they will be left behind in the Industrial revolution, Elbaror has consoldiated their resources and begun construction. Crown has developed a southern rivertown of Maryan. Oren, upriver of Elbaror, has shown much more growth. A large chunk of populations has migrated up the river from Elbaror to found Norwood. Also, a loggers village has been founded on the edge of the heavy woods in Oren, named Lukla. Even though people have been settling in Norwood, hundreds have instead continued marching north in search of rumored gold in the mountains and hills north east of Oren. In the Darkwoods, The settlement of Riza has prospered from its export of logs for the lighter forests of Elbaror, and is hoping to trade with the wood-lacking Topsailians. Explorers from Riza have encountered a centaur-like species in the deeper woods. //Pictures and maps will be posted soon. The new legislation of the colony has now made names for the new colony's provinces. The main one, where the colonists first landed, is called Carvaak, after Mount Carvaak. 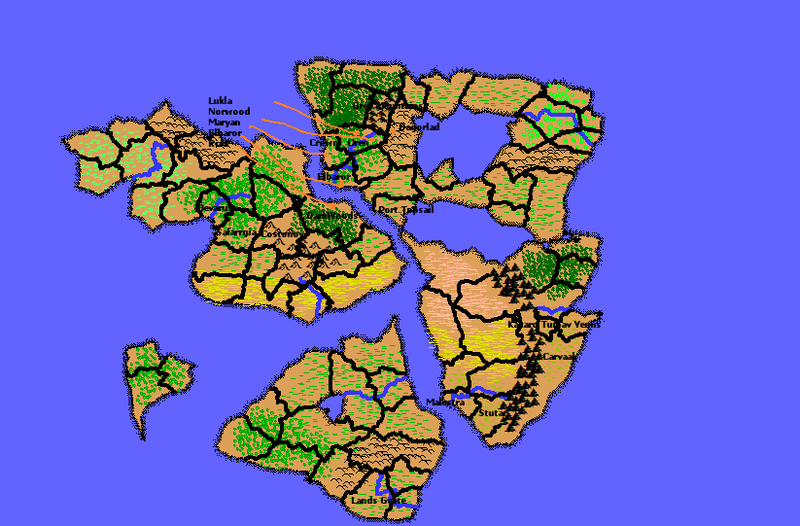 Starting in the southwest and going clockwise, the provinces are named Stutar, Malestra, Kakaro, Tumav, and Yeniis. The first person born in the colony was born just a day after the legislation, in Carvaak. Population is now 10,001. A colonists (Kelly Ashford) watched as more ships arrived, some she didn't notice the flags painted on their hulls hoping that they are friendly. at the southern most point of the colony the New Armali port was completed and the tests on the animals that were killing came out that its safe for consumption and the water in the river was safe to drink. Water pipes were installed and the housing units had running water. Commander Ed Shepherd supervised the military patrols on a holographic table (Called the SMI) that shown the island and all the patrols that were active, there was not hostile activities since landing. The MSV Black Flag Everest Class Dreadnought was docked at port all looked perfect. Topsail Empire launches a colonization project to make a small town on the edge of a massive salt flat in Topsail's newest territory, Southlands, located directly south of Port Topsail. 50 brave colonists have invested in salt harvesting, and are making a fortune as salt on Eden is a rare commodity. Also, to further Topsail Empire's influence on the planet Topsail Empire has claimed the oblong province directly east of Port Topsail, to be named Ithmus Territory. News: Jacob Hurgeson, the former leader of the colony, was found dead this morning in his living chambers. The cause appears to have been a combination of old age and stress. A new leader will have to be elected, probably under the form of a republican society, which will soon be organized. The colonists have continued their rapid industrialization, and have now begun the construction of two airports, one located in Condihu - where a mine is being dug, and the other located in Carzchx, where the factories turn the ore into steel, and from there into processed goods. The shipyard at Bevarus has expanded capacity, and is now able to produce more than just fishing boats; they have produced their first military vessel, a cruiser, which will aid the other five ships (obtained from the last shipment) to protect the waters of the Grandean Sea. As the number of factories increases, so does the demand for oil. This has led to the massive effort to find deposits in the nearby landscape. Some were discovered in southeast of Saffargia province, where forest fades away to become a marshy swampland. A smaller deposit was also discovered on the northwestern coast of the Grandean Sea. Oil derricks have been deployed to harvest these resources, scarce as they may be. The Twin Bridges have been completed, granting the colonists easy access to the other side of the Taireth River. These bridges have proven to be increasingly important as oil is now transported across them from the derricks in the west. In addition, two new cities have been founded: one being Sesyton in Bevarus province, the other in the west near the oil fields - Port Sillmad. Port Sillmad has been declared far enough west to be in its own province, which was named the province of Sellesia. Port Sillmad will now aid Bevarus in the construction of naval vessels, and has joined the industrial revolution by building its own factories. While the colony continues to thrive, and the population continues to increase, so does the demand for supplies, most essentially salt. Some salt has been discovered in the form of rock salt while mining in the Costonovan mountains, and some has also been produced by boiling off sea water. This has only been in very small quantities however, and we definitely need more in order to continue to thrive. As such, plans have been created for a salt water distillery in Port Sillmad, and if that is successful, the same will spread to Carzchx. In the meantime, however, we wish to formally request a trade agreement with Topsail Empire for salt, and the many other supplies that are needed by the El Fiji Grandean colonists. Topsail Empire agrees to begin the trade of salt with El Fiji Grande in return for lumber and other resources that are scarce in the Port Topsail Province. Topsail Empire wrote: Topsail Empire agrees to begin the trade of salt with El Fiji Grande in return for lumber and other resources that are scarce in the Port Topsail Province. Any particular exchange rate that would interest you? I seem to be a bit lacking in Topsailians, and your initial deal seems to be a bit low for me. 2 kilograms per log by itself seems a little below what I'd like, but fair-sh none the less. However, there are certain transportation costs, so I would rather the exchange rate be 3 kg salt per log. how about... 2.5 kilograms of salt per log? Topsail Empire wrote: how about... 2.5 kilograms of salt per log? I will go 2.6 kilos of salt per log. No more. Topsail Empire wrote: I will go 2.6 kilos of salt per log. No more. Then it's a deal. nice doing business with you! So, East Ibsenia. what do you want to trade for salt? Topsail Empire wrote: Then it's a deal. nice doing business with you! Excellent. The first shipment of logs will arrive in a few days (//tomorrow//), containing 300 logs. In return, 780 kg of salt. The Dominator Class Hovership is the main way of trading on Eden. It is roughly 20 meters long, is armed with a light plasma cannon and 6 anti-ship missiles, and can carry up to 20 soldiers in full gear or the equivalent payload. Mining intiatives in the Grey mountains jave produced a small goldfield, not large enough to be worth trading. 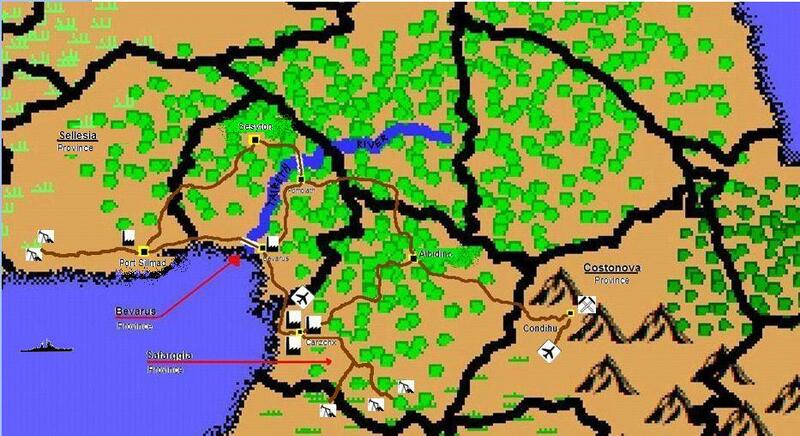 However, The foothills of Dagorlad seem to be rife with oil, and piping has been constructed. An initiative to construct highways has been launched by Liza Stark, called Project RunAway. Liza hopes to dig deeper into the Grey Mountains to find more ore. Meanwhile, Riza in the DarkWoods has become a logging metropolis. Unfortunately, a group of ecologists have rallied to protect the woods on Eros. They seem to be home to the Carunt. A centaur-like species that seems to have demonstrated full sentience. Translators have begun to try to inderstand them. The ecologists are concerned that logging is destroying the Carunts habitat. We have the Gryken around Port Topsail, but they are ferocious little creatures. living on the plains are large lizards, up to 10 feet long. I will agree to 0.4 kilos per pelt.